As you may wonder if there will be any portable media device with Karaoke function and how practical will that be, the recently announced Sony product may give you some clue. During this week, the Japanese company has rolled out a new Walkman model named as E450 with new Karaoke, Language Learning features and other enhancements. Featured with a 2-inch QVGA LCD Display, E450 has been redesigned with new easy-to-use interface and integrated with a few storage options ranging from 4GB, 8GB with up to 16GB, it provides sufficient audio and video multimedia storage with excellent sound quality utilizing Clear Audio, VPT and Dynamic Normalizer Technologies. Besides, its SensMe technology can help to analyze, categorize and create new themed channels based on music library to match personal listening preference. That is not all, another great selling point is its Lyrics Sync support with ability to synchronize and display all wording on its screen, allowing users to sing along in Karaoke mode. When this is enabled, the device will able to tune down the original singer voice audio, letting the users voice to be heard clearly just like when you are singing in Karaoke lounge. For those students that would like to do language learning besides entertainment purpose, the device has been enhanced with new Language-learning feature with ability loop back selected sentences with adjustable playback speed for learning pleasure. Good thing is, the portable media device is so power efficient that it can run music and video playback up to 50 hours and 10 hours respectively without the need of recharging. 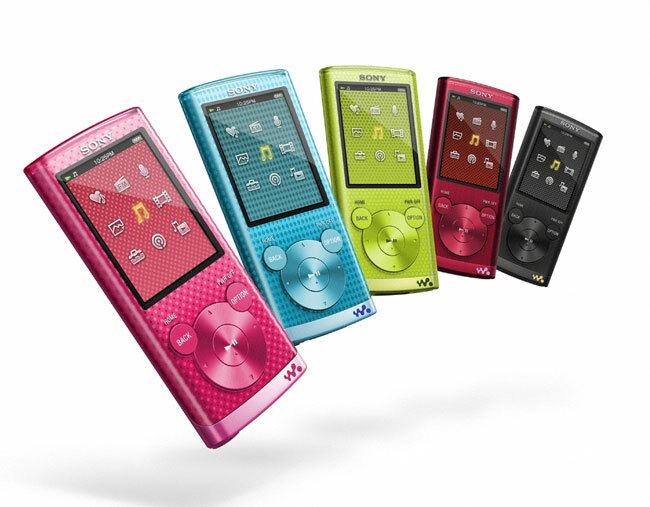 Available in red, blue, black, green and pink colors, the new Sony Walkman E450 will be commercialized by August from $108 onwards.